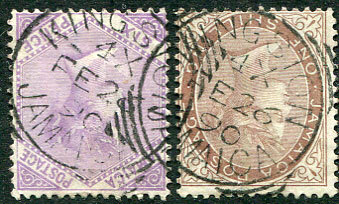 (SQC) dated 4X/FE 26 90 on re-united QV 6d, 1/- (SG.12,13, Crown CC watermarks used 1890). 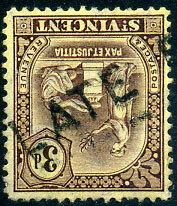 (PMK.78) on 1909 3d Badge (SG.106). (SQC) 1 X/SP 15 92 on QV 6d CC wmk (SG.12). (SQC) V X/AP 3 90 on QV 6d mauve CC wmk (SG.12). (SQC) V X/DE 6 90 on QV 6d orange-yellow CA wmk (SG.23a). 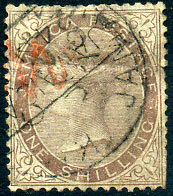 (D/R) dated X/JA 22 03 on QV 6d orange-yellow CA wmk (SG.23a). (T.13) down train 18 MRT 95 on ½d, 1d x 2d (SG.205,206) for postage and 6d (SG.210) for LATE FEE charge on piece. 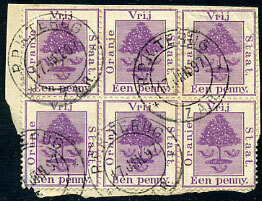 QV 1d pale blue Pine wmk (SG.1) most unusually cancelled by cds (normally the "A01" killer) dated AP 8 63, small tone-spot. Trace of further cds at top right suggesting that this possibly was part of a 4d or 6d rate multiple. 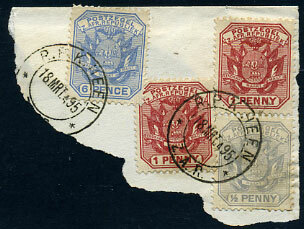 Examples dated as such are rarely seen but JY 24 62 on QV 4d, AP 24 63 on QV 6d, and MY 27 64 on QV 4d are recorded. Sailing dates from Kingston to England were around 8th and 25th of the month suggesting this cds might have been applied to late fee mail.